School's closed. A mom from Ian's school called last night. We got a robo-call at 5:30 am from Jonah's school. And when I checked my school's website at 6:30, I was relieved to see that my school had also closed. I wasn't sure how I was going to find a babysitter and shovel the driveway before 9. Steve, of course, walked to the train station at 6:45 as usual. But the rest of us are happy residents of Lazytown. 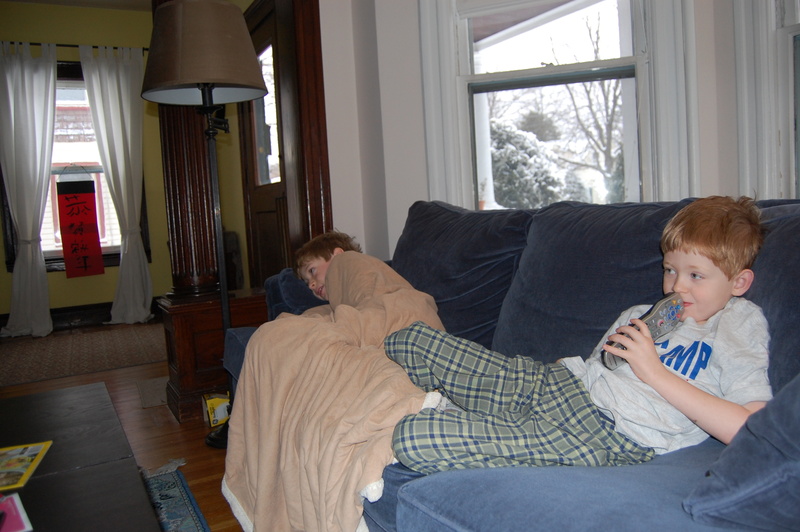 I have finally relinquished control of the remote, and the boys are watching Ben 10. If you’ve ever watched the show Lazytown clear through to the credits, you’ll learn other reason why Iceland needs to get back to honest pillage. Of course, when we get back to New England, we’re going to have to dig out our card in order to get home from the airport.